Thanks to Tez Says for showing the new cover for The Reckoning by Kelley Armstrong, the final book in her YA The Darkest Powers Trilogy. Release date April 27, 2010. The blurb is after the cover but if you haven't read the first two books there are spoilers. Oh my gosh, you are like the best ever. I have read The Sumining and The Reawaking, and i was so upset to find out that your third book wil lnot be out till MAy 1st 2010. I know your mom works at the Meford Librarya dn that is where i found the books. i was siked to find that out. i can not wait for the next book to come out, i am so sad with out it lol. LOVE YOUR BOOKS KIRSTEN!!! Rebecca thanks for expressing your enthusiasm! xX_LIzZ_Xx hope you manage to hold out! Samantha Kelley travels around quite a bit for appearances. I'll bet you get a chance to meet her sooner than you think. 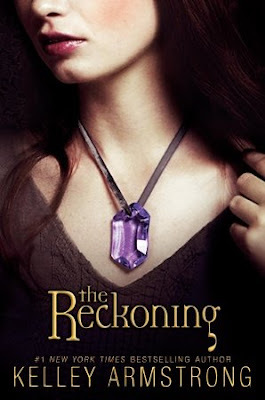 i love the book the reckoning . i cant tell you guys what its about yet. some places says it came out some say it didn't . ill wait a little longer to spill. the only thing im going to say is that Derk and Chloe kiss!! i mean like a real passionate kiss. Simon was really respectful toward their relationship and in letting go of Chloe. i cant wait for the book after this one if there is even going to be one! hopefully. comment to my comment.lol! WHAT?? you have to tell me MORE!